By the age of 20, Daniil Mishin, a businessman from Sevastopol, had already established the Bear Hostel chain, which currently already includes seven hostels in Moscow and Ukraine that target young travelers. As the next step, Mishin is planning to partially outsource the business and expand into Russia’s regions. When Daniil was 11 years old, his family had to stay in Berlin with no more than €20 in their pockets for the three of them, after they missed their train from Berlin to Warsaw. With no friends or family to stay with and a hotel room out of the question, their money was just enough to pay for three beds in a city hostel. Back home in Sevastopol, Daniil became obsessed with the idea of a European-style hostel. The boy persuaded his parents to put his grandmother's flat at his disposal: After he and his school friends completed the necessary refurbishments, Sevastopol's first hostel opened there a few months later. In the first four months of the season, the undertaking yielded the first $10,000, which, as Mishin and his friends reckoned, sufficed to open a few more hostels. He finished school early and entered the Sevastopol branch of Moscow's Academy of Labor and Social Relations. After visiting his brother in Moscow, however, he decided to stay in the capital. He negotiated his transfer to Moscow within the academy and found a job as the administrator of the Yellow Blue Bus hostel. Once he had figured out the specific nature of economy-class mini-hotels on the Moscow market, Mishin opened his own 28-bed hostel named Olympia (with the Olympic bear as its mascot). This first project cost him 1.5 million rubles ($47,300), requiring all the money he raised from the Ukrainian hostel and a contribution from his brother. The young entrepreneurs tried to be as thrifty as possible: They bought beds from a prison supplier under a government contract and used bedding decommissioned by a Ukrainian railway company. It took Olympia three months to break even, and Mishin opened another hostel with 30 beds in a nearby building that same year. Once both Olympia hostels started to make a profit, the businessmen sold the company and set up a new chain under the Bear Hostel brand. In late 2010, his first mini-hotel, close to the Smolenskaya metro station, was opened — a project with better living conditions and furniture that cost 3 million rubles ($94,500) to launch. The business attracted a few bankers, who invested over 30 million rubles ($945,000) in the project (by the end of 2012, the investors had already pulled out). The young businessman used the injection to open hostels close to the Arbatskaya and Mayakovskaya metro stations. “Our clients are mainly young visitors to Moscow between the ages of 17 and 25, who are unwilling to pay extra for a hotel room, regardless of the purpose of their trip, and want to save money for more enjoyable things,” Daniil Mishin said. Accommodation at Bear Hostels costs just over 700 rubles ($20) a night on average, with the price covering a bed (at Bear Hostels, rooms can have between 2 and 16 beds), free Wi-Fi Internet access, TV, a kitchen and a security box. According to the businessman, he has no plans to raise prices, sticking to the policy of annual indexing by no more than 3-4 percent. The network now encompasses four hostels in Russia (three in Moscow and one in Perm) and four more in Ukraine. Bear Hostels rent over 70 percent of premises. Mishin plans to open a few 3-star hotels and a few hostels in other regions by the end of this year, deliberately steering clear of St. Petersburg and its already saturated market. The businessman relies on an outsourcing business model, which implies that catering, travel package sales, bookkeeping and financial accounting are delegated to partners. Last year, the company earned more than 65 million rubles ($2.05 billion) and, this year, the average bill — depending on the number of tourists in a group and their stay — has reached 3,400 rubles (around $105). Apart from regional expansion and venturing on to the cheap hotel market, Daniil Mishin's short-term plans include building roadside hotels along Russia's main highways and setting up a network of cheap hostels (from 300 rubles [$9.5] per night) for workers in Moscow. He also plans to finance new projects himself, without attracting outside investment. 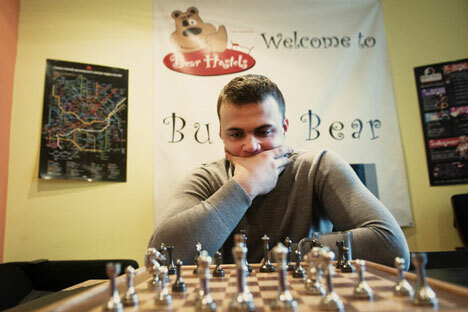 Meanwhile, according to Bear Hostel competitors, Mishin's success story is hardly unique. Arik Pogosian, owner of the PS Hostels chain (boasting seven hostels), cautions that the regional expansion Mishin is eying deprives new outlets of any individuality. “If all rooms are equipped identically, with the same range of services available — which is a must if the owner is in a different region — the brand loses its individual flavor,” said Pogosian. Anna Pulcheva, founder of the Narnia hostel chain (four in St. Petersburg, three in Moscow) pins hopes on expanding through partnership programs. “We enter into partnership agreements implying 50/50 profit sharing, where we are actually providing administration services,” she said.